The theme and pattern for this book was first developed in a lecture given by the author at Carnegie Hall, New York, December 2, 1942. An aroused public interest in the subject led to further research with enlargement of the findings and this publication in book form. World democracy was the secret dream of the great classical philosophers. . . .
Western Hemisphere and selected it to be the site of the philosophic empire. . . .
function until the Great Work is accomplished. . . . The American nation desperately needs a vision of its own purpose. AMERICA can not refuse the challenge of leadership in the postwar world. Mere physical reconstruction of ravaged countries and the reorganization of political, economic, and social systems is the lesser task we will face. The larger problem and the great challenge is in how to set up a new order of world ethics firmly established on a foundation of democratic idealism. Experts in various fields have already submitted programs designed to meet the needs of those nations whose way of life has been disrupted by war. But with the failing common to specially trained minds, these planners incline to think mostly in the terms of their own particular interests. As yet, no one has touched the fundamentals of international ethics. No one has advanced a working plan securely based upon a broad, deep, and sympathetic understanding of the human being and his problems. The thinking has been in the dual fields of power politics and material economics, with remedies expressed in terms of charts, blueprints, patterns, and industrial programs. But, there is one new and encouraging element present in most of the recommendations of today's experts. They are recognizing the necessity of conceiving the world as one inter-dependent structure. Yet, even as they recognize the need for a unity of human interests, their recommendations are for the perpetuation of highly competitive economic policies, which, if they are consistently applied, must lead in the end to war and discord. It is not an easy task to unite the efforts of the human race toward the accomplishment of any common good. Mankind in the majority is selfish, provincial in attitude, and concerned primarily with personal success and acquiring creature comforts. It will not be possible to build an enduring peace until the average man has been convinced that personal selfishness is detrimental to personal happiness and personal success. It must be shown that self-seeking has gone out of fashion, and that the world is moving on to a larger conception of living. The postwar planners have more of idealism in their programs than has ever before been expressed in the problem of the relationships of nations. But it still is not enough. A clear and complete statement of a world purpose is required - a world dream great enough to inspire unity of world effort. These are the days of America's opportunity to lead a still troubled mankind toward a better way of life. If we meet this challenge, we will insure not only survival of our nation for centuries to come, but we shall gain the enduring gratitude of our fellowmen and Americans will be remembered to the end of time as a great enlightened people. It is not enough that we solve particular problems. We must solve the very cause of problem itself. Wars, depressions, crime, dictators and their oppressions, are the symptoms giving clear indication of a greater ailment. To examine each problem solely in terms of the problem itself, without recognition of its true relationship to a larger and more universal necessity, is to fail in the broader implications of an enduring peace and prosperity. Experience should have taught us long ago that policies which have originated from material considerations and attitudes have proved inadequate. The whole story of civilization and the records of history tell us that all such adjustments hold no hope of lasting peace or security. But, here we are again preparing ourselves to be satisfied with temporary solutions for permanent problems. The recognition is long overdue that we oversimplify the problem of world peace when we think that process is one of breaking the task down for examination of its materialistic parts, and then hopefully devising an applicable remedy for each of these. The physical conditions of human existence are not the whole of the human problem. We could adjust all material considerations to the point of supremest equity, and yet accomplish virtually nothing solutional. The greatest of known problems is the human problem. And not until all embracing examination is made into every phase of human needs can there be an adequate reconstruction policy for a postwar world. That man is physical is obvious; but he is also mental, and emotional; he is spiritual, and he has a soul. These latter factors are not so obvious. What to do about them is not so easy; for they are difficult to understand, and even more difficult to classify and reduce to a working pattern. We as builders of a civilization will have to learn that only when equal consideration is given to each of these elements of man's nature will we arrive at the solutions for the disasters into which men and nations precipitate themselves. Our postwar reconstructors - ours, if not by our selection, at least with our consent - are not outstandingly qualified for this broader task. Few indeed are the statesmen and politicians who have any conception of man as a spiritual being. And as for military leaders, they are primarily disciplinarians, invaluable as such in times of war, but not at all emotionally geared to problems of individualistic peacetime character. And world planners recruited from among our industrial leaders, it must be admitted, are not generally informed on the workings of the human psyche. Those who have made the study of human conduct their life work, the sociologists, have little scientific knowledge of the hidden springs that animate that very conduct into its amazing diversity of manifestations. And if a word is to be said for bringing in the clergy, it might be that the theologian planner who will be truly useful will be one who acquires at least some knowledge of the science of biology. We are displaying a woeful lack of vision in the way we fumble with the eternal laws of life. It is not enough that we now hopefully create a setup permitting men to give allegiance with their minds or to serve faithfully with their bodies. We must some day face the truth that man is inevitably and incurably an idealist; for this is the truth that will set us free. Man's need is for the idealistic content of his nature to be properly nourished; then his whole consciousness will impel him to right action -and then no more will our laws fail, treaties be broken, and the rights of man stand violated. The American nation desperately needs a vision of its own purpose. It must conceive it in a generous idealism, great and strong enough to bind thoughtless and selfish persons to something bigger than themselves. It must recognize that it is in the intangible ideal that the foundations are laid for all seeable good, must know that the truly practical course and the course of hard realism for America is the one that is laid basically in a generous idealism. This is more than an indicated course. It is one that we inevitably must follow, guided by the hand of destiny. Believing this to be so, I dedicate this book to the proposition that American Democracy is part of a Universal Plan. Our world is ruled by inflexible laws which control not only the motions of the heavenly bodies, but the consequences of human conduct. These Universal motions, interpreted politically, are impelling human society out of a state of autocracy and tyranny to democracy and freedom. This motion is inevitable, for the growth of humans is a gradual development of mind over matter, and the motion itself represents the natural and reasonable unfoldment of the potentials within human character. Those who attempt to resist this motion destroy themselves. To cooperate with this motion, and to assist Nature in every possible way to the accomplishment of its inevitable purpose, is to survive. Thousands of years before the beginning of the Christian era many enlightened thinkers discovered the will of God as expressed through Nature in the affairs of men. They made known their discoveries in terms of religions, philosophies, sciences, arts, and political systems. These first statements are now the admired monuments of ancient learning. Available to men of today, they are generally ignored. Years of research among the records of olden peoples available in libraries, museums, and shrines of ancient cultures, has convinced me that there exists in the world today, and has existed for thousands of years, a body of enlightened humans united in what might be termed, an Order of the Quest. 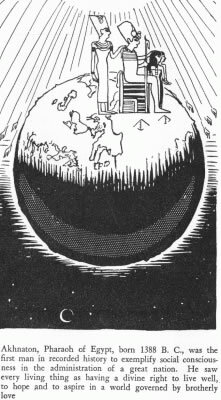 It is composed of those whose intellectual and spiritual perceptions have revealed to them that civilization has a Secret Destiny - secret, I say, because this high purpose is not realized by the many; the great masses of peoples still live along without any knowledge whatsoever that they are part of a Universal Motion in time and space. Pythagoras, Plato, Aristotle, Buddha, Jesus and Mohammed are among the greatest names recorded in history; but it is not customary to regard the men who bore these names as statesmen or sociologists. They are thought of as philosophers, sages, seers, and mystics, whose doctrines have no application to the political needs of an industrial civilization. Yet it is men like Plato and Buddha who still exercise the most powerful force in mortal affairs toward the perpetuation and preservation of a civilized state among all nations. All of the great leaders of ancient times realized and taught that the establishment of a state of permanent peace among the nations depended not only upon the release of human ideals, but through properly trained and disciplined minds capable of interpreting these ideals in terms of the common good. World democracy was the secret dream of the great classical philosophers. Toward the accomplishment of this greatest of all human ends they outlined programs of education, religion, and social conduct directed to the ultimate achievement of a practical and universal brotherhood. And in order to accomplish their purposes more effectively, these ancient scholars bound themselves with certain mystic ties into a broad confraternity. In Egypt, Greece, India, and China, the State Mysteries came into existence. Orders of initiated priestphilosophers were formed as a sovereign body to instruct, advise, and direct the rulers of the States. 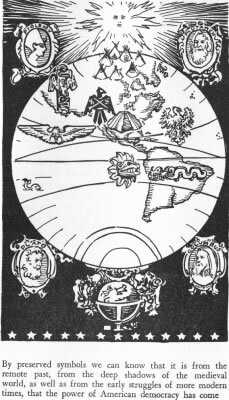 Thousands of years ago, in Egypt, these mystical orders were aware of the existence of the western hemisphere and the great continent which we call America. The bold resolution was made that this western continent should become the site of the philosophic empire. Just when this was done it is impossible now to say, but certainly the decision was reached prior to the time of Plato, for a thinly veiled statement of this resolution is the substance of his treatise on the Atlantic Islands. One of the most ancient of man's constructive ideals is the dream of a universal democracy and a cooperation of all nations in a commonwealth of States. The mechanism for the accomplishment of this ideal was set in motion in the ancient temples of Greece, Egypt, and India. So brilliant was the plan and so well was it administrated that it has survived to our time, and it will continue to function until the "Great Work" is accomplished. Philosophy set up its house in the world to free men by freeing them of their own inordinate desires and ambitions. It saw selfishness as the greatest crime against the common good, for selfishness is natural to all who are untutored. It recognized that the mind has to be trained in the laws of thinking before men can be capable of self-rulership. And it knew that the democratic commonwealth can be a reality only when our world is a world of self-ruling men. And so it is from the remote past, from the deep shadows of the medieval world as well as from the early struggles of more modern times, that the power of American democracy has come. But we are only on the threshold of the democratic state. Not only must we preserve that which we have gained through ages of striving, we must also perfect the plan of the ages, setting up here the machinery for a world brotherhood of nations and races. This is our duty, and our glorious opportunity. It seems to me that the basic plan for the postwar world should be one solidly founded in this great dream of Universal Brotherhood. It is not enough to work on the problem solely in terms of politics and industry. The formula must express a broad idealism, one which appeals to the finest intuitions of man, and one universally understandable by all who have lived, dreamed, and suffered on this mortal sphere. he was the first realist in democracy, the first humanitarian, the first internationalist. . . . He saw that the duty of the ruler is to protect for all the right to live well, to think, to dream, to hope, and to aspire. . . .
For his dream of the Brotherhood of Man he cheerfully gave his life. MAN has passed out of the state of savagery and become a civilized creature with the development of social consciousness. Civilization is a collective state. In our collective type of life the isolationist is a detriment to himself and a menace to all others. There is a great difference between isolationism and intellectualism. Development of the mind releases the individual from mob psychology, but it does not set him apart from the common responsibilities of his kind. A true thinker becomes a force for good within the group life. If his intellectual powers lure him away from the practical problems and values of his world, he can no longer make his contribution to the social unity. Political reforms are not accomplished by the people, but through the people. Behind all collective progress stands the enlightened individual's leadership. His superiority does not free him from common responsibility; his is the obligation to assume the greater burden of directing his vision to the well being of all his people. Let us see how this works. We'll go far back to ancient times. Akhnaton, Pharaoh of Egypt, throned under the title Amen-Hotep IV, is often referred to as the first civilized human being. While this may not be literally true, he was definitely the first man in recorded history to exemplify social consciousness in the administration of a great nation. Akhnaton, the beloved child of the Aton, was born at Thebes about 1388 B.C. Like most of the princes of his house, he was extremely delicate as a child, and it was feared that he would not live to reach the throne; as the last of his line, the dynasty would end with him if he died without issue. For this reason he was married in his twelfth year to a ten year old Egyptian girl of noble birth, named Nefertiti. During the childhood of the young king, the Queen mother, Tiy, ruled as regent of the double empire. She is believed to have been of Syrian origin, which would account for the many strange and un-Egyptian ideas in religion, government and art which were developed during the reign of Akhnaton. Queen Tiy, brilliant and capable, had recognized before her son reached his majority that in him were qualities more divine than human. The son became the actual ruler of his country in his eighteenth year; his reign extended for seventeen years. Akhnaton had been ruler of Egypt only about two years when he opposed his will to the priesthood of Amon-Ra. By attacking the oldest and most firmly established of all Egyptian institutions, the young Pharaoh created legions of enemies and brought down upon himself the wrath of the religion of the State. He could scarcely have chosen a surer way of complicating the problems of his life. In the midst of this conflict he proclaimed a new spiritual dispensation, and to escape his enemies built a new capitol city, one hundred and sixty miles up the Nile from Cairo. His new faith was Atonism; and he named his city Khut-en-Aton - the Horizon of the Aton - and dedicated the city with these words: "Ye behold the City of the Horizon of Aton, which the Aton has desired me to make for Him as a monument, in the great name of My Majesty forever. For it was Aton, my Father, that brought me to this City of the Horizon." As High Priest of his new religion, Amen-Hotep IV changed his name to Akhnaton, because the older name included the word Amen, whose faith he had rejected. Charles F. Potter, in his History of Religion, says of Akhnaton that he was, "the first pacifist, the first realist, the first monotheist, the first democrat, the first heretic, the first humanitarian, the first internationalist, and the first person known to attempt to found a religion. He was born out of due time, several thousand years too soon." From his twenty-sixth year to his thirty-first year, Akhnaton devoted his life to the perfection of his mystical doctrine in the city which he had built for the Ever Living God. Here he taught the mystery of the Divine Father, and wrote the simple and beautiful poems which have endured and survived time. To Akhnaton, God was not a mighty warrior ruling over Egypt, speaking through the oracles of his priests; he was not a Supreme Being flying through the air in a war chariot leading armies of destruction. Aton was the gentle father who loved all his children, of every race and nation; and desired for them that they should live together in peace and comradeship. Even more, God, the Aton, had created all the lesser creatures, whether birds that nested in the papyrus reeds along the banks of the Nile, or dragonflies with many colored wings that hovered over quiet pools and the lotus blooms. The Aton was the father of all beasts, and fishes, and flowers, and insects. He had fashioned them in his wisdom and preserved them with his love and tenderness. Akhnaton, seated in the garden of his palace, spent many hours watching the flight of birds and listening to the voices of little creatures. He tells us that he found the Aton in all of them; and that his heart went out to them, and he gave thanks for the goodness in everything that lived. This was a Pharaoh who traveled alone through the countryside, meeting the peasants, conversing with slaves, and sharing the simple food of the poor. To the most ignorant man he listened with profound respect, for in each of his subjects he sought and found the life of the Aton. He saw the Universal God shining through the eyes of little children, beheld the beauty of the Aton in the bodies of the men who worked in the fields. He could not understand why others did not see God in everything, as he did. Like most of the great religious leaders, Akhnaton accepted the social problem of life as part of religion. He could not accept the inequalities of birth, wealth, or physical estate as a justification for men persecuting each other or exploiting one another. He saw every living thing having a divine right - a right to live well, to think, to dream, to hope, and to aspire. He saw it the duty of the ruler to protect this beauty in the hearts of his people, to nourish it, and to give every possible opportunity for its expression and perfection. Religious intolerance was impossible among those who worshipped the Atan, and there was no room for political intolerance in a world governed by the laws of brotherly love. Each man became the protector and comforter of all other men, cherishing the dreams of others equally with his own. In his personal life Akhnaton emerges as the first man in history to bring dignity and gentle beauty to the management of his home. He was the father of seven daughters, to whom he was completely devoted, and in his speeches and public pronouncements he always referred to Queen Nefertiti as "my beloved wife." It was usual for the Pharaohs to cause themselves to be depicted in great stone carvings upon the walls of their palaces. They were represented as majestic figures, crowned and sceptered; they were shown either seated on their thrones or wielding their weapons against their foes. Akhnaton was the only Pharaoh in the history of Egypt who chose to be depicted with his arm about his wife, with his little daughters playing about and seated on his lap. As with the passing years the health of the Pharaoh grew worse, the opposition of the priesthood of Amon-Ra grew greater; and his reign was complicated by invasions by the Hittite nations. The governors of various provinces pleaded with him for help, but Akhnaton would not send armies. The dreamer king saw his lands pillaged and his cities conquered; but he would not kill his enemies; they, too, were children of the Aton. Akhnaton died in his thirty-sixth year, at the altar of the Aton in the temple of the faith he had created. When his mummy case was found, the following prayer to the Aton was discovered inscribed on golden foil beneath his feet. "I breathe the sweet breath which comes forth from Thy mouth. I behold Thy beauty every day .... Give me Thy hands, holding Thy spirit, that I may receive it and may be lifted by it. Call Thou upon my name unto eternity, and it shall never fail." In the words of the great Egyptologist, Professor Breasted, "There died with him such a spirit as the world had never seen before." Akhnaton was the first man in history who dared to dream of the Brotherhood of Men, and he cheerfully gave his life and his empire for that dream. He is indeed, "The beautiful child of the Living Aton, whose name shall live forever and ever." in the great human experiment of the democratic commonwealth. THE ancient Greeks had a far better knowledge of geography than popular opinion today indicates. We have been deceived as to the full measure of classical learning, because the Greeks did not commit the larger part of their knowledge to writing, and they bound scholarship with the vow of secrecy. In ancient days all learning was regarded as sacred; wisdom was entrusted to the keeping of priest-philosophers; and they were permitted to communicate the choicest branches of the sciences only to duly initiated pupils. To bestow knowledge upon those who had not prepared their minds by years of discipline and self-purification profaned the mysteries, desecrated the sacred sciences. Some years ago, in discussing this fine point in ethics with the late Professor James Breasted, the most distinguished of American Egyptologists, he confirmed my own findings; and further stated it to be his personal conviction that the classical civilizations concealed most of their learning under legends, myths, and allegories; and these have long been mistakenly accepted as the literal beliefs of these peoples. There can be no doubt that the existence of a great continent in the Western Hemisphere was known to the ancient Greeks. And also to the Egyptians and the Chinese. It is nothing short of foolish to assume that the ancients lacked ships sufficiently seaworthy to navigate the larger oceans. Long before the Christian era, the older civilization had constructed boats far larger and more seaworthy than any of the vessels used by Columbus. One of the Ptolemys of Egypt built a ship large enough to have an orchard of fruit trees on the deck, together with swimming pools and fountains stocked with live fish. Calculations based upon Plutarch's description of ancient voyages seem to indicate that the Greeks not only reached the coast of America, but explored the St. Lawrence river and part of the Great Lakes area. Plato, in his treatise on the destruction of Atlantis, wrote that due to the commotions in the ocean caused by the submergence of a vast continent, all navigation to the west ceased for a long period of time. This statement can only imply that such navigation had taken place in remote times. Greek mythology perpetuates the knowledge of a blessed land beyond the Western Boundaries of Ocean. In this blessed land dwelt the Hesperides, the beautiful daughters of Night, and here also at the end of each day the sun came to rest. In popular mythology the Hesperic Isles were a kind of terrestrial paradise. Thus, under a thin veil of mystic symbolism, was concealed the account of a Western continent of great size, fertile and rich and abounding in all good things. The ancients believed the earth to be surrounded by the sphere of the constellations, and they assigned to each country the star groups which were above that country's particular area of land. In the arrangement preserved in the writings of Aratus of Soli, the constellation of the eagle spreads its wings accross the North American continent; the serpent winds its coil over Mexico and Central America; and the dragon floats in the sky above Japan and China. Perhaps Sir Edward Landseer was not far wrong when he declared that the symbols of nations, and the emblems peculiar to their heraldry, originated in their ruling constellations. Just about everyone knows that the constellation of the Great Bear is in the sky aver Russia, and since time immemorial the bear that walks like a man has been the accepted symbol of the Russian State. Thus in many ways we discover indications that the old races were wiser than we thought, and that what we have called discoveries are really only re-discoveries. Beyond the western bounds of the ocean they located the fair land set aside by the gods to be the earthly paradise. Here in the fulness of time all men would come in search of the Golden Fleece which hung upon the tree sacred to the apples of the sun; and the early explorers did travel to the West in search of a Golden Fleece - the gold of the Incas, the treasures of the Aztecs, and the jeweled temples of the seven cities of Cibola. It was in an old book which is in the British Museum that I found another and even more important key to the meaning of the Golden Fleece. It was known to the Greeks that the Golden Fleece was in reality a parchment on which was written the secret of human immortality. It was this parchment that Jason sought, for whoever discovered it would gain the secret of enduring empire, and power over the whole world. We have now in America, enshrined in the Congressional Library, a Golden Fleece - the American Declaration of Independence, written on the skin of an animal and preserved as the magic formula of human hope. Those who understand it and can use wisely the import of its writings are possessed of the secret of the immortality of human society. The curious fortunes of war brought another Golden Fleece from across the sea, and it is now preserved together with our own; this second parchment is the Magna Charta, the English bill of human rights which was the inspiration behind our American Declaration of Independence. These two immortal documents together form the declaration of the rights of man and are the basic texts of modern democracy. By the wisdom then of those gods who are eternally vigilant over the needs of man, the blessed lands of the west were set apart, for none of the great civilizations of the past rose in North America to overshadow the continent with the ruins of old tradition, or to set up the corruptions of old administrative policy. Foreign nations came to this continent in times long ago; but they formed no permanent settlements nor attempted any program of colonization. And so the soil was not impoverished by thousands of years of intensive cultivation, nor were the natural resources ravished to supply the substance to maintain endless wars and ageless feuds. It was the rise of the democratic dream in Europe that supplied the beginning of western civilization. Those in search of a promised land turned to the west. Here was a virgin continent populated only by nomadic Indian tribes, a vast territory suitable in every way for the great human experiment of the democratic commonwealth. By the nineteenth century the American Hesperides was definitely the land of golden opportunity, and to it came streams of immigration from nearly every country on the earth. The better way of life drew them here, for it had been established that here men could build a future free of tyranny, intolerance, and enforced poverty. Here all were given opportunity for education, for free enterprise, and living a life according to the dictates of hope and conscience. If in a comparatively short time many racial streams have met and mingled, and a new race has been born, the American race is not one to be determined by an analysis of blood or the proportions of the cranium. Americans are a race determined by the measure of a conviction, set apart by that conviction; it is the conviction that human beings are created free, and are entitled to equal opportunity to perfect themselves in life, liberty, and the pursuit of happiness. And in recent years we have made another discovery. It is that the race of democracy is one distributed throughout the whole world. Among men and women of all races and all nations are those who share our conviction, and because they share it they are of our kind and belong to our race. In this realization we mark the beginning of world democracy. Wise men, the ancients believed, were a separate race, and to be born into this race it was necessary to develop the mind to a state of enlightened intelligence. The old philosophers taught that physical birth is an accident, for men are born into various races and nationalities according to the laws of generation; but there is a second birth, which is not an accident; it is the consequence of a proper intent. By this second birth man is born by enlightened intelligence out of nation and out of race into an international nation and an international race. It is this larger and coming race that will some day inherit the earth. But unless a man be born again by enlightenment, he shall not be a part of the philosophic empire. Our age of gold will pass and some day the Golden Age will come again. A future greatness is right now casting its long shadow across the face of Nature. With each passing generation the responsibilities of the American people will increase. More and more we shall be looked to as a source of courage, strength, and hope. And it will be in this way that we shall fulfill the destiny for which our nation was created by dreamers of long ago. From the Blessed Isles of the West must come the fulfillment of the promise of the ages. and became acquainted with the imperishable laws for the government of nations. DEBT has been the common burden of the ages, and yet the whole structure of our modern economic world is built on the shaky foundation of Bills Payable and Bills Receivable. Long ago, interest ate up its own principal, and we terest on our own are currently living on the inunliquidated debts. Solon, greatest statesman of the Greek world, was handed this age-old problem when, about 595 B.C., he was summoned to the leadership of the State with the title, Archon. He was given unlimited powers to reform the economic and constitutional systems of the Athenians. His first move was to attack the old Attic law of debt which he believed lay at the source of the public distress. In the time of Solon, the Greek countryside was littered with roughly hewn stone markers. Originally these were boundary stones fixing the property lines of the lands of various citizens. As time had passed, it had become the custom to carve into these stones the records of mortgage contracts affecting the property which they bounded. Single stones became insufficient after a time, and eventually the added monuments to debt interfered with the plowing of the fields. Solon, investigating the tragedy of the mortgage monument, made several interesting discoveries that were to change the course of human economics. When poor farmers mortgaged their lands to rich families on neighboring estates, and the debts were not paid, the wealthy landowners moved their boundary stones to include the encumbered property, and the previous proprietors became tenants. These tenants were obliged to pay one-sixth of their products for the privilege of working the soil; and if they failed their persons were attached and they became slaves. This was the Attic law which Solon abolished, the law which permitted loans on the security of the debtor's person. When Solon restored the freedom of all who had been enslaved for debt, the reform was highly acceptable of course to the poorer classes; but it found little favor with the landowners. They immediately set to work in a conspiracy to discredit Solon and force him out of office. Thus, back in very olden days, when life was very simple, the basic problems which harassed the State and burdened the legislators stemmed from the persisting fallacies of human nature. In further effort to bring some semblance of order out of the Athenian chaos, Solon also attempted a reorganization of social classes, giving political existence to large groups never before represented in government. He divided the citizenry into four groups reminiscent of old Brahman castes. He then readjusted taxation so that the poorer classes all paid equally an approximate 5 percent of their income. Equalizing the tax burden according to individual means paved the way for an equality of representation in the governing body. All citizens who paid taxes were entitled to be heard in matters of the common good, and were privileged to elect magistrates. These steps marked the beginning of the democracy of the ancient Greeks. But the greatest of all of the reforms of Solon took place in the courts of justice. Selection of juries was by lot, with all citizens participating, even the poorest; and these juries were upheld over the pressures of established privileged groups. One of the most curious of Solon's regulations throws light on the difficulties of his time. He forbade that a bride should bring to the house of her husband more than three changes of garment and91like personal furniture.' He also ordained that each citizen must stand ready to show at any time to properly authorized persons how he obtained his living. Any citizen failing to do this would lose his franchise. The drastic changes of Solon made him so many enemies that after a few years he felt he had to relinquish the burden of leadership of the State to regain his honor. Those who hated and feared him, as Archon, promptly renewed their love after he left public office and no longer threatened their ambitions. His term as Archon brought to Solon the realization of his own inadequacy; and he visited Egypt in search of a larger wisdom. He was received with kindness and every mark of respect by the priests at Sais who served the shrine of the Goddess Isis. To these wise men he told the story of his effort to enlighten the Greeks, and correct the evils in their laws. The High Priest of Sais is reported to have said, "Alas, you Greeks, you are but children; for you know not the wisdom of the gods." One night the priests of Sais led Solon through the long dark pasageways of the temple. They descended stone stairs rutted with age and lighted only by flaming torches, came at length to subterranean chambers hewn from the living rock. Through these chambers flowed a river. The priests said that this river was the sacred Nile that flowed from Egypt through the underworld to water the fields of the immortals. On the bank of the underground stream a small black boat was waiting, rowed by men who were blind. Accompanied by the High Priest and the torch bearers, Solon was rowed out over the dark waters. The boat stopped on the shores of a tiny island far under ground. The light from the torches fell on two tall columns that glistened; they appeared to be made of some strange metal, covered with curious writing in an unknown language. The High Priest, pointing his golden rod at the pillars, explained their mystery to the astonished Solon. These columns, he said, were placed on the island beneath the ground thousands of years ago by a lost people which had vanished forever from the earth. The pillars were of an unknown metal which neither rusted nor deteriorated with age. He continued: Once long ago there existed on the earth a vast empire, the power of which extended to every corner of the world, and great fleets of merchant ships sailed the seven seas and brought their wealth to its fabulous city of the Golden Gate. Here there were schools for the study of the mysteries of Nature; towers for the examination of the stars; mines beneath the earth from which the precious metals were brought forth in abundance. This empire was ruled over by seven kings, who were the descendents of Neptune, God of the Seas. Then came the fatal day when the seven kings of the Islands of the West in disobedience to the laws of the gods resolved to conquer the whole earth. And thus it was that war came into being, for before that time there had been no strife among men. And the seven kings led an army against the ancient Greeks and they invaded all of Europe, coming in great ships from the west. This, Solon was told, occured about 9000 years before the seige of Troy. The gods were angry because the seven kings had made war. They caused the earth to be shaken and the great Islands of the West vanished into the sea. In a single night, sixty million human beings perished because they had disobeyed the laws of heaven. In time even the name of the Atlantic Empire was forgotten; for it must ever be so that those who disobey the gods shall vanish from the memory of mankind, regardless of their wealth or power. "From these ancient columns" said the High Priest, "we have read the laws that were given in olden times for the government of nations. These laws are not made by men but are the Will of Eternal Nature. Upon these laws enduring States must be built. To depart from these laws is to die. So perished the nations of the elder world." When Solon returned to Greece it was his intention to take the story of the Atlantic Empire and develop it into a great epic poem; but the infirmity of years and the responsibilities of the State interfered. Instead, Solon told the story in the fullest detail to his close friend, Dropis, who in turn recited it to his son, Critias. In his 90th year, Critias communicated the narrative to his grandson of the same name who later became a disciple of Socrates. It is in this way that the story of the lost Atlantis came finally to be incorporated in the Platonic dialogues as part of a conversation between the younger Critias and his master Socrates. The dialogue itself was named the Critias. and who bound themselves by oath to obey the divine laws of enduring empire. . . .
by earthquake and fire . . . . interpreted politically, it is the story of the breaking up of the ideal pattern of government. THE destruction of Atlantis, as described by Plato in the Critias, can be interpreted as a political fable. The tradition of the Lost Empire as descended from Solon was enlarged and embellished according to the formulas of the Orphic theology; but it does not follow necessarily that Plato intended to disparage the idea that a lost continent had actually existed west of Europe. Plato was a philosopher; he saw in the account of the fall of Atlantis an admirable opportunity to summarize his convictions concerning government and politics. The Critias first describes the blessed state of the Atlantean people under the benevolent rulership of ten kings who were bound together in a league. These kings were monarchs over seven islands and three great continents. From the fable we can infer that the ten rulers of the Atlantic league were philosopher kings, endowed with all virtues and wise guardians of the public good. These kings obeyed the laws of the divine father of their house, Poseidon, god of the seas. In the capital city of Atlantis stood the temple of Poseidon, and in it a golden figure of the god. In this shrine also stood a column of precious substance inscribed with the laws of enduring empire. The ten kings took their oath together to obey these laws, and they chose one of their number, usually of the family of Atlas, to be the chief of their league. It was written on the column of the law that the ten kings of Atlantis should not take up arms against each other, for any reason. If one of them should break this law the other nine were to unite against him to preserve the peace. In all matters concerning the public good the ten kings were to deliberate together, and each should be mindful of the just needs of the others; for they were the members of one body and regents over the lands of a blessed god. The kings had not the power of life or death over any of their subjects except with the consent of the majority of the ten; and each was responsible to the whole league for his conduct in the administration of his own State. In this way Plato describes the government of the Golden Age, in which men live on Earth according to the laws of Heaven. By the three great continents of Atlantis are to be understood, Europe, Asia, and Africa; and by the seven islands, all the lesser peoples of the earth. The league of the ten kings is the cooperative commonwealth of mankind, the natural and proper form of human government. The Atlantis, therefore, is the archetype or the pattern of right government, which existed in ancient days but was destroyed by the selfishness and ignorance of men. Plato, it must be remembered, was a monarchist by philosophic conviction, but his ideal king was the wise man perfect in the virtues and the natural ruler of those less informed than himself. This king was the father of his people, impersonal and unselfish, dedicated to the public good, a servant of both the gods and his fellow men. This king was descended of a divine race; that is, he belonged to the Order of the Illumined; for those who come to a state of wisdom then belong to the family of the heroes - perfected human beings. Plato's monarchy was therefore a philosophic democracy; for all men had the right to become wise through self-discipline and self-improvement. One who achieved this state was by virtue of his own action a superior man, and this superiority was the only aristocracy recognized by Natural Law. Competition is natural to the ignorant; and cooperation is natural to the wise. Obeying the pattern established by the gods, the divine kings bound themselves into the common league to obey its laws, preserve the peace, and punish any whose ambition might impel them to tyranny or conquest. Here then, is a pattern of world government to insure the prosperity of all peoples and activate the preservation of the peace. Plato describes at some length the prosperity of the Atlantic Isles under this benevolent rulership. The citizens were happy, and poverty was unknown. A world trade was established, and the ships of the Atlantean marine traveled the seven seas, bringing rich treasures to the motherland. There was little crime; the arts flourished; and the sciences were cultivated in great universities. Men had no enemies, and war was unknown. The god Poseidon guarded the destinies of his domains and favored the Atlantic Empire with a good climate and fertile soil. Men followed the occupations which they preferred and lived a communal existence, together sharing the fruits of their labors. It was Plato's conviction that the human being was not created merely to engage in barter and exchange, but rather to perfect himself as the noblest of the animals, endowed with reason and the natural ruler of the material world. The Critias then describes the gradual change that came about in the course of the ages. In the beginning the Atlanteans saw clearly that their wealth and prosperity increased as a result of friendship. But gradually the divine portion of their consciousness began to fade away in them; their souls became diluted with a mortal admixture and human nature gained ascendency. They became unseemly and lost those spiritual virtues which were the fairest of their precious gifts. It is the story of how man departed from the perfect pattern of his conduct, and in the end denied the very truths which were the foundations of his strength. With the loss of his spiritual perception, material ambitions increased, and the desire for conquest was born. Men yearned after that which they had not earned, and gazed with covetous eyes upon the goods of others. The rulers of the State were corrupted by the common evil; the ten kings were no longer friends; they no longer conferred together in the temple of Poseidon to decide all matters under the common oath. Thus was the great league dissolved by selfishness and ambition. It was then that war came into being, and with it tyranny and oppression, and despotism and the exploitation of peoples. At last the kings of Atlantis decided to use their common power to enslave all the peoples of the earth. They gathered a vast army and attacked Europe from the sea, even going so far as to besiege the Athenian States. And so they broke the law of the gods; for the twelve deities had so divided the earth that to each race and nation was given its proper part. Zeus, father of the gods, who carries in his hand the thunderbolts of divine retribution, perceived the evil of the time, and resolved to punish the arrogance of the Atlanteans. But even Olympus is a commonwealth, and the other eleven gods were summoned to the council hall of the immortals. "When all the gods had assembled in conference, Zeus arose among them and addressed them thus - " ... it is with this line that Plato's story of Atlantis ends; and the words of Zeus remain unknown. But the results of the conference are not left in doubt. Zeus hurled his thunderbolts against the empire of the sea, shaking it with earthquakes and then destroying it by horrible combustion. The only records that remained were in vague traditions and two columns set up under the temple at Sais. The destruction of Atlantis can be interpreted politically as the breaking up of the ideal pattern of government. So complete was this destruction, that men forgot there is a better way of life, and since have accepted the evils of war and crime and poverty as inevitable. The world lost too all sense of its own unity; each man's hand was thereafter raised against his neighbor. The perfect state disappeared under a deluge of politics; the priests of Poseidon gave way to the priesthood of Mammon. Plato's political vision was for the restoration of the Empire of the Golden Age. The old ways of the gods must be restored, he was convinced, if human beings are to be preserved from the corruptions which they have brought upon themselves. Plato sought this end when he established his university at Athens - the first school of formal education in history. Here men were taught the great truths of religion, philosophy, science, and politics, to restore to them the vision of the perfect State. The old Atlantis was gone, dissolved in a sea of human doubts. But the philosophic empire would come again, as a democracy of wise men. Two thousand years later Lord Bacon re-stated this vision in his New Atlantis. Christopher Columbus, who may have been an agent of esoteric order connected with Lorenzo de’ Medici and Leonardo da Vinci; English intellectuals Bacon and Raleigh, who played unique roles in the court intrigue surrounding the settlement of the continent; Founding Fathers Washington and Franklin, who had esoteric associations; and a network of Rosicrucians, mystics, and Freemasons whose ideals of religious freedom traveled to American soil. Whether discussing the symbolism of the Great Seal of the United States, the prophecy at George Washington’s birth, or the role of a mysterious stranger who swayed the signers of the Declaration of Independence, The Secret Destiny of America is the sole volume to link together the fascinating strands of esoteric history that lie at America’s heart. Ascension Research Center is run and maintained by students of the Ascended Masters, and is not sponsored by any organization.